Osborne B E & Weaver C F, 2012, Phillimore, Large Quarto, approx. 192 pages, 200 illustrations, size 27cm x 30 cm. 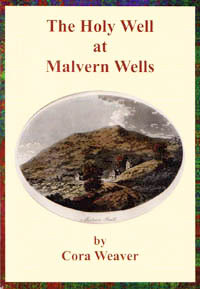 A masterpiece that is the culmination of 20 years researching the springs and wells of the Malvern Hills, published by Phillimore. This is the ideal explorers guide enabling the reader to discover the location and often the astounding and long forgotten history of over 130 celebrated springs and wells sites around the Malvern Hills. The book is hard back with dust cover, large quarto size with lavish illustrations and extended text. Celebrated Springs contains about 200 illustrations and well researched text over a similar number of pages, together with seven area maps to guide the explorer to the locations around the Malvern Hills. 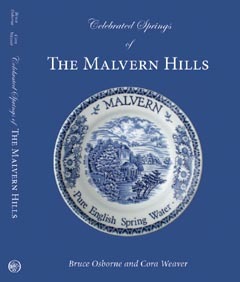 It also includes details on the long history of bottling water in the Malvern Hills. This book is published with the assistance and support of Coca-Cola. A guide to historic Malvern Spa's town centre, including street map, informative text and picture scrapbook. Twenty locations are explored with archive and modern day full colour illustrations. Each guide comes in a neat plastic case and is A2 size folded. Ideal for those wishing to discover this fascinating town as well as a good source of historic background to the water features. Taking a party around? One free with every 5 that you buy. Now into a third edition (2012), this scholarly work re-examines the legend of the founding of Malvern in the 11th century. 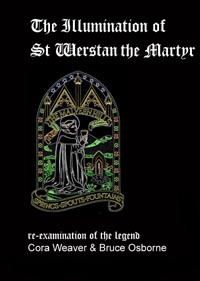 It concludes that St Werstan was the original martyr saint who established his hermitage near the present day St Ann's Well. This site is believed to have been once called St Werstan's Well and was an original medieval Holy Well dedicated to this local saint. His legend is recorded in the ancient windows of Malvern Priory but has been erroneously dismissed by some historians as a fabrication. 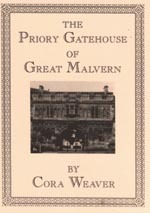 This published paper puts his life and work into a proper perspective and as such plays an important role in understanding Malvern's history and St Werstan's relevance to the local Springs and Wells. Publisher - Cora Weaver, 20 pages, 27 illustrations, including maps, Size: 15cm x 21cm. 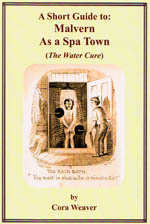 An entertaining glimpse at the life of 19th century water cure patients and their doctors. A map shows the locations of the main water cure establishments. Designed as a day or weekend guide. A visitors guide to this remarkable building which has survived for more than 500 years and is now the home of Malvern Museum. DISCOVER THE LATEST REVELATIONS The latest book from Friends of Malvern Springs and Wells historian and author Cora Weaver was launched in June 2015. It uncovers a previously unpublished history of the Holy Well based on original documents and oral histories from people who worked, lived or collected water there. Today the Holy Well is famous because it is the only place where the Malvern Hills' famous spring water is bottled. But for most of its life it was renowned as a place where people from far and wide came to be healed. The book tells who came for treatment; where they came from, and how they applied the water to their diseased bodies. Other revelations in the book include how the iconic well house developed into its present state.This book is a MUST HAVE for ramblers, local interest and Holy Well enthusiasts.